Monday February 1st 1904 It was rather a cold day but I did a lot of sweeping and cleaning did not get through till four oclock. Mollie took her dinner. i read all the evening. Tuesday February 2nd 1904 It was a fearful cold windy day. The stove in the kitchen smoked so the work was very hard. The men could do nothing but the chores. i was fixing my red calico dress. I read at night. Wednesday February 3rd 1904 A little more pleasant. I did some baking in the forenoon. I finished my calico dress in the afternoon and read in the evening. The men busy about their regular work. 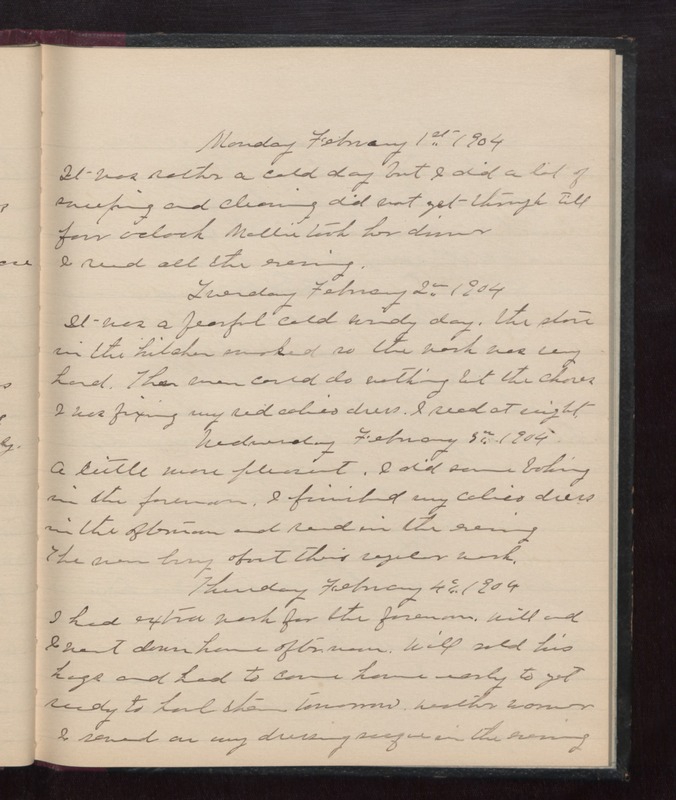 Thursday February 4th 1904 I had extra work for the forenoon. Will and I went down home afternoon. Will sold his hogs and had to come home early to get read to haul them tomorrow. weather warmed. I sewed on my dressing sacque in the evening.